Markus Anteskog (born 73) has worked for several years with art projects about the downsides of social constructions, its disasters. 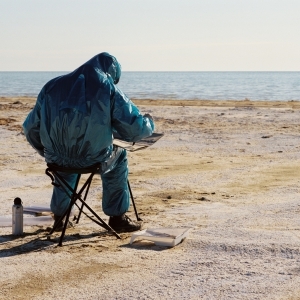 Sculptures in asbestos and nature painting in watercolor from the toxic water of the The Aral Sea, has previously been shown as ideological rubble or hermetically secured works. With the exhibition Graveyard Buildings Markus has chosen to work with his own personal experience of disaster, a stroke , that he suffered in 2007. In a suite of ink paintings he examines his presence against the obstruction (partial paralysis, strength and vision loss ) that the stroke caused. The artwork series comprises some 20 paintings, mostly depicting churches. The churches in the image suite is memorabilia, the model sets of the photos are from a compilation series from the magazine Svensk Damtidning which Markus grandmother collected . The churches reflect the position between life and death, where Markus found himself after his stroke. They are heaven place on earth. The project also has paintings of clouds, which is the final visual impression Markus remembers before the stroke . Markus Anteskog is trained at the Royal Art Academy in Stockholm (1999-2004) , and has on several occasions exhibited both in Sweden and abroad. Prior to the exhibition at Pannrummet, Konstepidemin he showed his works in Gothenburg at Galleri Box 2012, in connection with the ”Slutrapport 2012:1” (group exhibition) and ”VIRUELLT VATTEN” at Hey It’s Enrico Pallazzo! 2010 (solo exhibition).